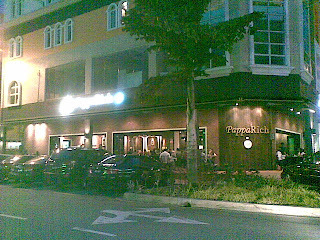 PappaRich kopitiam is one of the newest modern kopitiams mushrooming around the country. I always wanted to visit the place after numerous good & bad reviews about this kopitiam. The chance arrived when I had a small yumcha session with Carmen & my ex boss, Shereen. We decided to have our little yumcha session at the Kota Damansara branch. 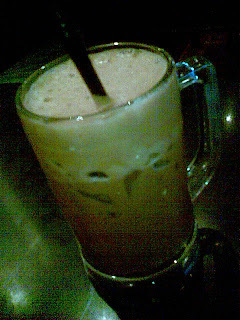 The setting was, as would any other modern kopitiam outlets nice & very presentable. However it was a little bit too dark for my liking...and the amount of mosquitoes...gah!!! annoying! The food was...average to say the least. 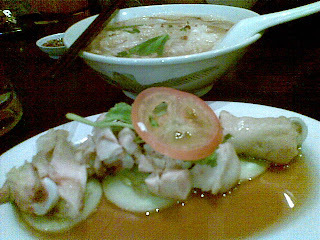 Carmen's kuey teow soup with steamed chicken was alright. The kuey teow were smooth and just right, but the chicken was bad. Overcooked & dry...she didnt finish the chicken. Worst thing is that she had the chicken drumsticks, so if it were the breasts i wouldnt dare to imagine how bad THAT would be. Shereen's steamed bread was good though. Soft & fragrant...overloading with butter & kaya...it was definitely a slice of heaven....the picture i took was somehow mysteriously corrupted, so heres a picture from their website. She had the one on the left. 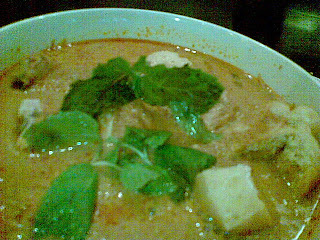 I decided to have the curry laksa. It was...bad. The noodles were a little bit undercooked, the soup was too thick & the chicken were undercooked. The chicken meat were still pink! I understand that these outlets hire banglas to cook in the kitchen but this is unacceptable! DO NOT order this in papa rich ever! All & all it was an OK experience. I absolutely hated my noodles but the cham iced was alright. Would just come back to this place just for the drinks. Bill came to RM41.05 for our food. Definitely a little bit overpriced in my eyes. Heres a map for you readers. I'll just provide the map & address for the kota damansara outlet. The rest of the outlets you can check out from their website attached below. Doggyjames says...Ok place for a cuppa coffee & fresh bread...stay away from the expensive mains! USJ to Hartamas is nearer than USJ to Kota Damansara! am VERY PISSED OFF TONITE AS I WENT TO PAPPA RICH IN KOTA DAMANSARA I WAS SO SURPRISED WHEN I OPENED UP MY TAKE AWAY CHICKEN HAILAM I SAW ONLY BLOODY SMALL SLICES IN THERE!!!! ITS LOOK LIKE "SISA ORANG MAKAN" THIS IS REALLY UNACCEPTABLE AT ALL! I PAY FOR RM82.70 FOR THE DINNER FOR MY FAMILY!!! I FEELS SO BAD AND SORRY TO MY BELOVED FAMILY FOR THE UGLY DISHES!!! !